Ethical H2O can help you protect your two most valuable investments, your family and our home with one of our whole house filtration and conditioning solutions. Whether you’re worried about the health of the water you drink or bathe in or want to protect your home from premature breakdown of pipes and appliances due to chlorine and hard water, we totally have you covered. Our entire product line is consciously designed to address today’s tough water issues while also boasting quality construction, design, durability and sustainability. Our standard system boasts both Granular Coconut Carbon to address chlorine and ammonia and other organic compounds along with Granular Coconut Catalytic Carbon which addresses the chloramines and trihalomethanes in the water (byproducts of the chlorine and ammonia) and TAC for hard hard water protection. Never buy plastic water bottles again! Enjoy fresh, healthy, purified water throughout the home. Your bathing experience just got a whole lot better! Unbelievably great for your skin and hair – a difference you can feel! Water that tastes amazing and feels great (no slippery feeling). Maintenance free for up to 10 years. Smart Timer monitors your water usage and helps save water. Multi certified for safety and performance. Why Is Showering In Filtered Water So Important? Your skin is your largest organ and chlorine is readily absorbed through the skin and inhaled through the lungs.Chlorine and ammonia can cause negative effects on both your health as well as your hair and skin. Most of us know the importance of drinking enough water and filtering it to avoid harmful chemicals or contaminants, but did you know that shower water can be just as harmful (if not more so) than drinking water? It may seem counterintuitive, but showering in chlorinated water can actually lead to more chlorine absorption than drinking the water. How is this you ask? Well showering at warmer temperature makes absorption through the skin much easier as pores open and the water is coming into contact with a large area of the body. In fact, research shows that the chlorine in bath or shower water can easily enter the bloodstream (as it has a low molecular weight) and can easily pass into the body. Plus, chlorine and ammonia (the disinfectants used by most municipalities) interact with other organic matter in the water forming harmful byproducts like trihalomethanes (THMs). THM’s that are being investigated by the Environmental Protection Agency (EPA) and are thought to be carcinogenic meaning it could have the potential to cause cancer. Additionally, warm air and water open lungs, making inhalation of these chemicals much easier and another avenue for chemicals to enter the body during showering. Chemicals absorbed through the skin can enter the bloodstream quickly and have a tremendous impact on the body. This is a fantastic benefit especially when it comes to things like topical health creams or vitamins that we want to enter the body quickly and in large enough amounts. It’s harmful however when it comes to disinfectants and their by products. This study even showed a greater lifetime risk of cancer and other problems from bathing or showering in chlorinated water than from drinking it. Some obvious offenders of indoor air pollution are some scented candles along with cleaning products and air fresheners but who would have thought that showering could affect your air quality? During hot showers chemicals vaporize and are released into the air at higher amounts than they are even present in the water itself. The EPA found significant and detectable levels of THMs and other byproducts in indoor air as a result of bath and shower water. Of course the association does not equal causation, but the evidence is strong and is why taking precautions against easy-to-eliminate sources of chlorine exposure is hugely beneficial. Many municipalities including the ones in San Diego County use a mixture of chlorine and ammonia which has its risks as well and may be even more irritating to the skin and lungs that just chlorine. More concerning though is that the combination of those chemicals create a byproduct called chloramines and when chloramines mix with organic matter in water (like decaying leaves) they create another harmful byproduct called trihalomethanes and other potentially carcinogenic chemical by products. Unfortunately, many filters that remove chlorine do not easily remove chloramines. Coconut Carbon alone cannot take out all the chloramines because it requires a really long contact time so by adding Catalytic Carbon you artificially create the contact needed to address the removal of the harmful chloramines. 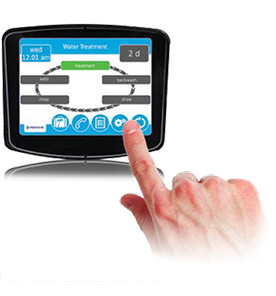 We use Fleck Premium timer heads because they offer greater client convenience, water usage tracking, help save water and and have features that make it a sustainable solution. UL recognized to the 979. TESTED EMC and Low Voltage Directive. Restriction of Hazardous Substance Compliant. 10″ x 54″ tank, 1.5 cu.ft., 41 lbs. Granular Activated Coconut Carbon and Catalytic Carbon, Fleck XTR2 digital touch screen timer, ¾”- 1 ¼”” line. Flow rate up to 10 gallons per minute (GPM). Recommended for homes with 2-3 bedrooms or up to 2500 sq. ft.
12″ x 52″ tank, 2 cu.ft., 55 lbs.of Granular Activated Carbon and Catalytic Carbon, Fleck XTR2 digital touch screen timer, ¾”- 1 ¼”” line. Flow rate up to 17 gallons per minute (GPM). Recommended for homes with 3-4 bedrooms or up to 3500 sq. ft.
13″ x 54″ tank, 2.5 cu.ft., 69 lbs. of Granular Activated Carbon and Catalytic Carbon, Fleck XTR2 digital touch screen timer, ¾”- 1 ¼”” line. 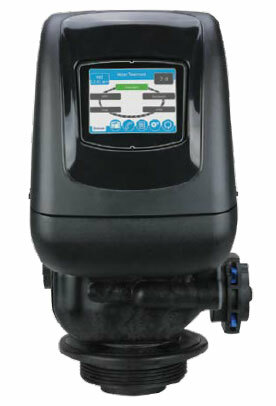 Flow rate up to 28 gallons per minute (GPM). Recommended for homes with 4-6 bedrooms or up to 6000 sq. ft.
14″ x 65″ tank, 5.4 cu.ft., 83 lbs. Granular Activated Carbon and Catalytic Carbon, Fleck XTR2 digital touch screen timer, ¾”- 1 ¼”” line. Flow rate up to 38 gallons per minute (GPM). Recommended for homes with 6+ bedrooms or up to 8000 sq. ft.
16″ x 65″ tank, 6.5 cu.ft., 97 lbs.Granular Activated Carbon and Catalytic Carbon, Fleck XTR2 digital touch screen timer, 1-2″ line. Flow rate up to 45 gallons per minute (GPM). Recommended for homes with 6+ bedrooms or up to 12000 sq. ft.
A recent study of more than 22 million taps across the US found 260 regulated and unregulated substances. While more than 90% of local tap water was in compliance, there were 141 substances unregulated by the EPA. Additionally, chemicals such as chlorine and ammonia are used in heavy doses as a disinfectant that then makes it to your home where you ingest, adsorb and inhale these chemicals. Filtering your water will limit your exposure to these chemicals and contaminants and provide a healthy, safe water that you and your family can enjoy! Order Your Ethical H20 Water Solution Today!